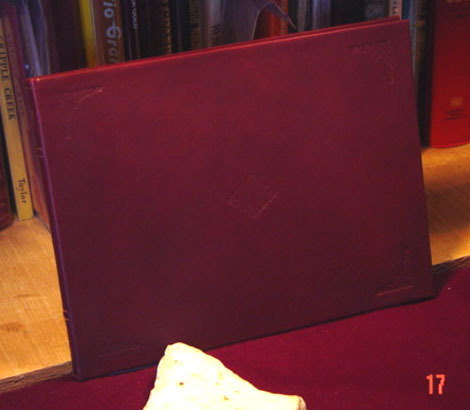 Original publication with new leather binding and marbled endpapers. Denver, Colorado. 82 pages, complete with advertisements. 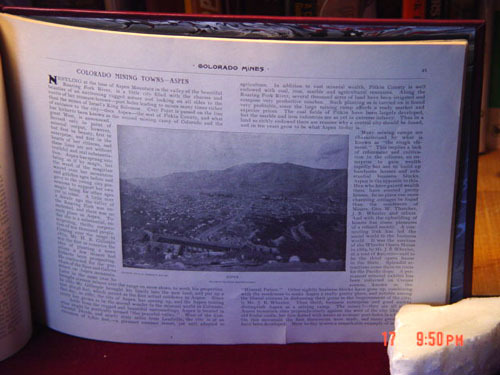 Extensive coverage of Aspen, Leadville, and Central City, Colorado, with the majority of coverage on Aspen and Leadville mines and mining men. Condition: very good plus; 6 pages in front and 2 in back have significant pieces missing; however, all details have professionally replaced, including any lost words. The remaining 74 pages are in very good plus to near fine condition. Dimensions: 13-1/2 inches wide by 10 inches in height. 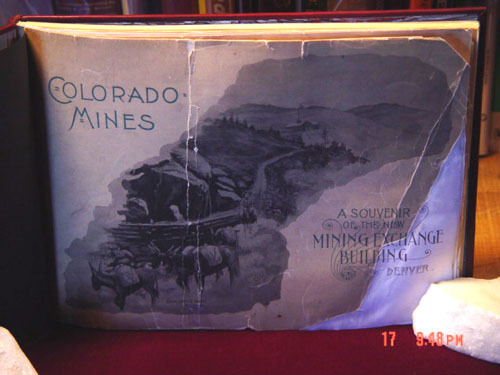 Similar format to MINES AND MINING MEN OF COLORADO, 1893. Possibly an early edition; however, significant differences in text, illustrations, and advertisements. Exceptionally rare publication. (Hooper, S.K.) 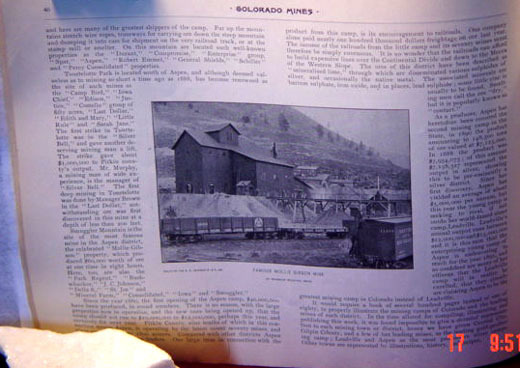 THE GOLD FIELDS OF COLORADO: A Brief Description of the Various Gold Districts Located on and Contiguous to the Line of The Denver & Rio Grande Railroad. Published under the Auspices of the Passenger Department, 1896. Publication lacks original covers, but has been re-bound in stiff wraps; 78 pages, with fold-out map at rear. Numerous half-tone illustrations of mines, towns, and other locations. Districts described: Cripple Creek and West Creek; Leadville Gold Belt; Silverton and San Juan Country; Ouray District; Gunnison District; Hinsdale County; and others. Condition: very good plus, except missing original covers. 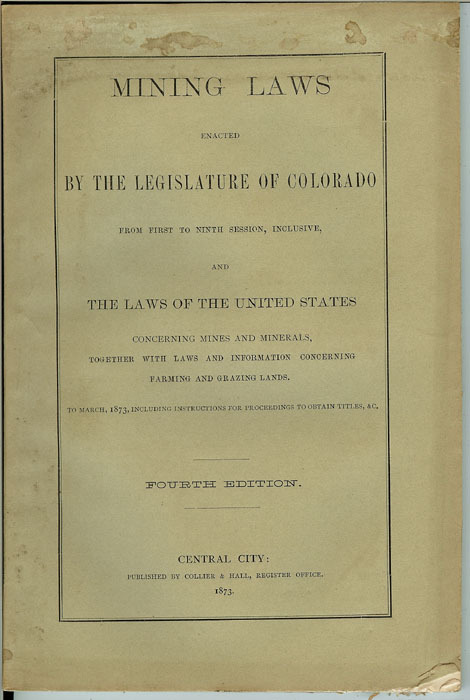 (Colorado Mining) MINING LAWS ENACTED BY THE LEGISLATURE OF COLORADO, From First to Ninth Session, inclusive, and The Laws of the United States, Concerning Mines and Minerals Together with Laws and Information concerning Farming and Grazing Lands. To March, 1873, including instructions for Proceedings to obtain titles, etc. Fourth Edition. Central City, Colorado Territory : Published by Collier & Hall, 1873. Original printed wrappers; 100 pages, very good plus condition. Rickard, T.A. VEIN-WALLS, A Paper Read before the American Institute of Mining Engineers, at the Pittsburgh Meeting, February 1896. Author's Edition, 1896. 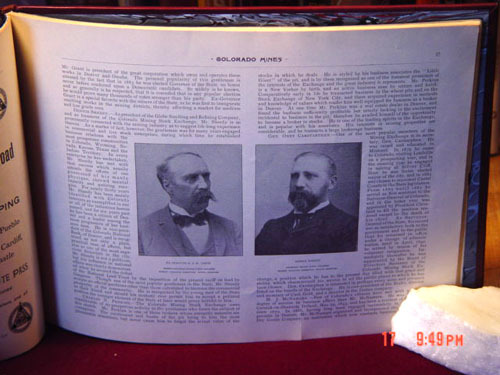 Publication in its original printed wrappers; square-bound; 49 pages; 33 figures, several of which were printed on enamel-coated paper. 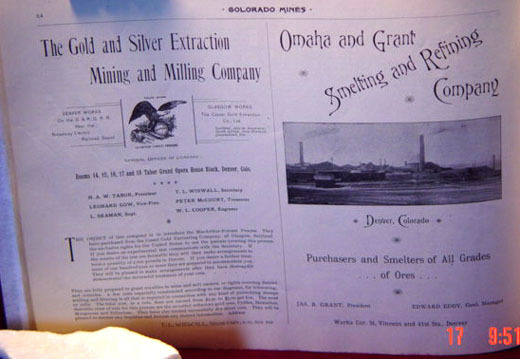 Paper uses as examples mining properties in Colorado: Clear Creek, Summit, Gilpin, and Dolores counties; however, also discourses mines in California, Montana, Oregon, and Victoria, Canada. Rickard was, at one time, Colorado's State Geologist. "With the author's compliments," written by Rickard on top of front cover; however, not signed by Rickard. Condition: near fine. (Utah Copper Company) THIRD ANNUAL REPORT OF THE UTAH COPPER COMPANY, for the Fiscal Year Ending June 30th, 1907. Submitted at the Annual Meeting of the Stockholders, held at Jersey City, NJ, January 24th, 1908. American Bank Note Company, Printers. Publication in its original stiff tan wrappers with copper and black print; 23 pages; plus, maps. Officers of this historically significant mining company included: C.M. MacNeill, D.C. Jackling, John Hays Hammond, K.R. Babbitt; and, Spencer Penrose. This is the Company that most notably employed the steam-shovel to open-pit mining, located in Bingham Canyon, Utah. Excellent half-tone illustrations, most all full-page. Maps: a) Longitudinal Section and Projection of Utah Copper Company's Bingham Mining Property; and, b) a fold-out topographical map of the Utah Copper Company's Bingham Mining Property. Condition of report: very good plus to near fine; some very light soiling to front cover. Issued 1934, uncancelled, two folds, otherwise in near fine condition. Mining property in Gilpin County, Colorado (re: THE MINES HANDBOOK).